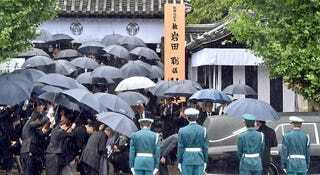 Thousands attended a two-day funeral service for the late Nintendo president Satoru Iwata in Kyoto, Japan this week, carrying umbrellas and even bringing Nintendo 3DSes to pay their respects. Over 2,600 people showed up during the first day and some 1,500 came on the second, Nintendo said in a statement to the Wall Street Journal. Nintendo’s Genyo Takeda—who along with Shigeru Miyamoto is serving as interim co-director of the company—said in a eulogy that they would carry on what Iwata had started. Other fans across the world have been saying farewell to Iwata in their own ways, writing messages and leaving flowers at the Nintendo World Store in New York City; paying tribute on Nintendo’s Miiverse online network; and even visiting Nintendo’s HQ in Redmond, Washington. Iwata, who served as Nintendo’s president for 13 years, died last weekend following a lengthy battle with bile duct cancer. He was 55. For more on the well-respected programmer-turned-CEO, read our obituary.